Shortly after returning from our seven month trip to Ethiopia in 2015, Pete was reminded of his dream to go sailing. For me sailing was quite foreign as I grew up in the Transvaal and was never really exposed to it. However, I am always up for adventure and so, when Pete asked if I would like to accompany him I didn’t have to think hard about joining him on an extended cruise. Pete became frantically busy with his sailing training and after he gained his Skipper’s ticket, he started researching yachts. The big issue was whether to buy a mono-hull or a multi-hull, in other words a ‘normal’ boat or a catamaran. Pete’s parents sailed from Saldanha Bay to Australia in their little (24 foot) home-built single hulled boat in the 1970’s and when asked if they would do it again, they said yes, but in a catamaran. Apparently mono-hulls sail better into the wind but catamarans are more stable and they provide a more convenient living space, which is quite important since experienced sailors reckon you spend 85% of your time at anchor when you circumnavigate. Catamaran cynics also say that catamarans are most stable floating upside down whilst catamaran lovers point out that mono-hulls are most stable at the bottom of the ocean. To me it didn’t matter which kind of boat we bought; I knew zip about sailing and any vessel would provide luxurious living space compared to our Hilux on our overland trip. I loved travelling that way, so I was sure I would be happy with whatever type of craft we chose. After much deliberation, Pete decided that a catamaran was the right boat for us and for about two months we spent most weekends viewing vessels that were up for sale. After missing two nice opportunities we acquired a Parlay 40 (a 40 foot) catamaran, Moondust. She is a well-equipped and spacious boat, with ample living space. Cruising her from Durban to Cape Town was my first sailing exposure, along what is recognised as one of the most dangerous coastlines in the world! 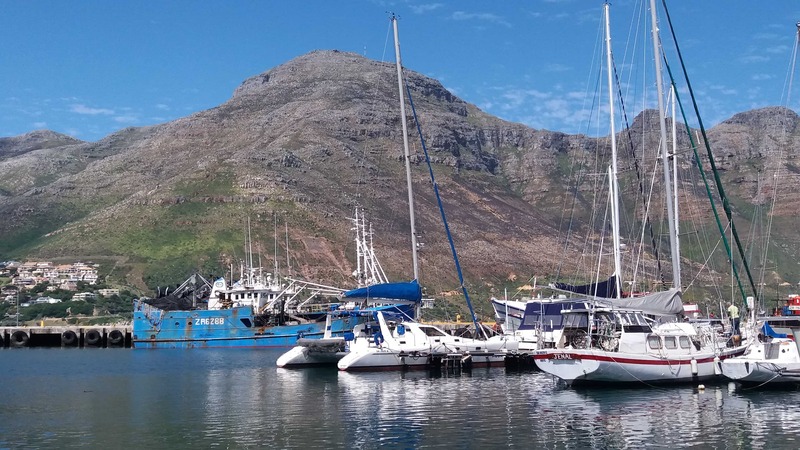 As I was seasick most of the time, I was extremely grateful when we safely reached Hout Bay harbour which would be Moondust’s home until we start our Atlantic ocean crossing towards the end of this year. Since arriving in the Cape Pete has been working on her pretty much full time to prepare her for a circumnavigation. She is 13 years old therefore many things needed attention. We realised that I also need to get involved full time if we want to make this new adventure happen. I will be doing a myriad of jobs, apart from doing research on communication at sea and our planned route. I also need to become a competent sailor and navigator and be able to handle Moondust single-handedly. 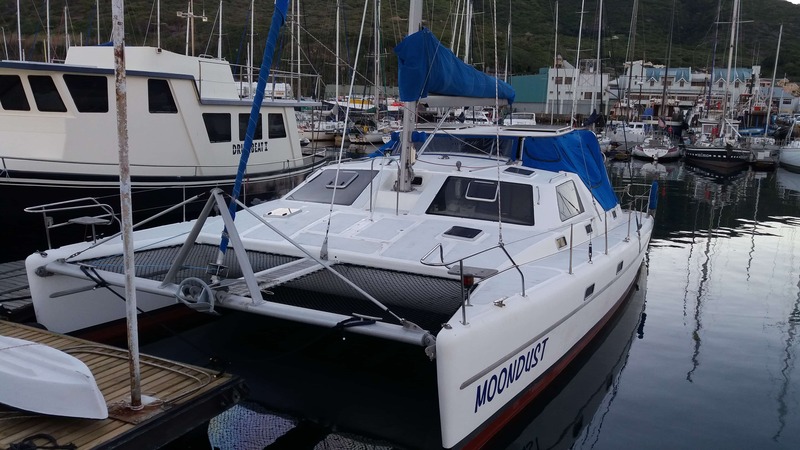 Moondust at anchor in Hout Bay. As excited as I am about this new adventure, I am also sad to leaveT4A after eight marvelous years. I found working in the overland environment an enriching and pleasant experience and I’ve made wonderful friends from all over the world who share my passion for travelling Africa, many of them following and commenting on this blog. I am eternally grateful to Tracks4Africa; to all my colleagues and especially Johann Groenewald and Wouter Brand. I have had many travel opportunities and it has been amazing to take part in the growth of this company. 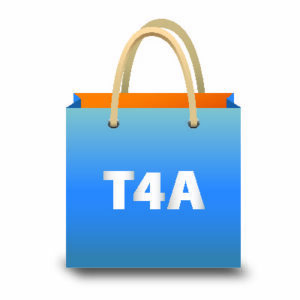 T4A started out as a GPS mapping firm but in my time here I’ve seen how data which is derived from the community of travellers is processed and packaged for different platforms to suit the needs of various travellers. Every time that Johann envisaged a new product, I stood in awe of his vision and courage, producing exceptional quality paper maps, guide books and the latest product, an Atlas of Southern Africa (to be on the market mid May). T4A has also stayed abreast of technology, developing apps for smartphones and tablets/iPads. There will be more exciting new developments in the future which I know will be welcomed by overland travellers. 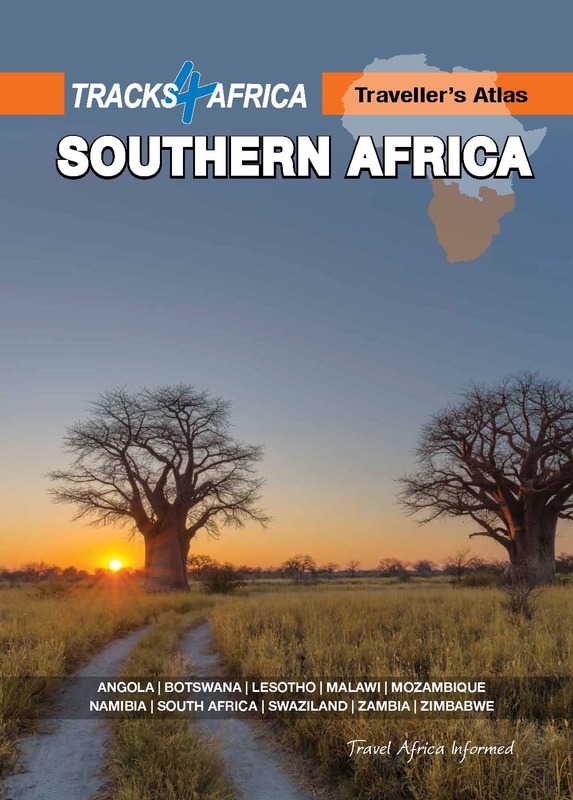 T4A’s newest product, the Traveller’s Atlas of Southern Africa. Whilst I am personally signing off as editor of the T4A blog it will continue and I encourage you to keep reading so that you can travel Africa informed. 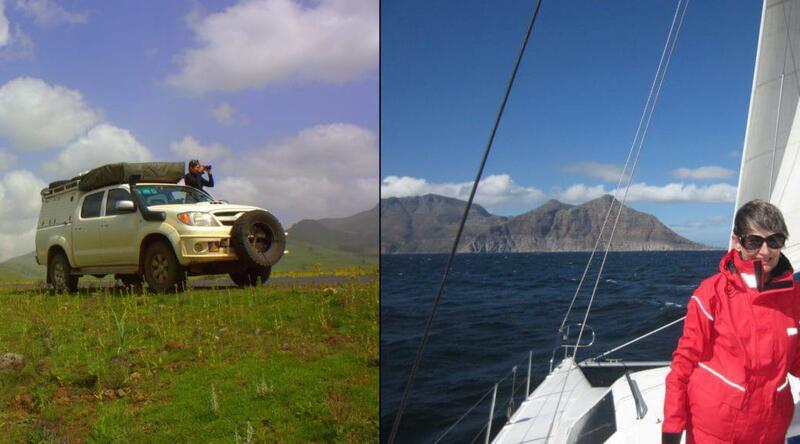 Those of you who followed our overland trip from Cape Town to Ethiopia and back in 2015 might like to ‘sail’ with us around the world. We’ll blog again, albeit not at weekly intervals but as and when an internet connection allows. If you would like to follow our voyage across the oceans, you can subscribe to our blog, Moondust’s Voyage. For the next six months we have to focus on preparing for our journey but in the meanwhile I have to become a competent First Mate and sailor. We plan to do the long ocean crossings on our own but we hope that family and friends will visit us in some of the most idyllic places the world has to offer at destinations along the way or whilst island hopping. So I am saying goodbye for now, but not farewell….This Sea Gypsy will return, because Africa is in my blood! may you just be blessed and enjoy your travels. Karin and Pete I wish you both everything of the best on your new adventure – dream it and do it! I will be following you along the way. Sad to see you move on. Have enjoyed your blogs and especially enjoyed following your Ethiopia trip when we were doing East Africa. Will continue to follow your seafaring. Enjoy and stay safe until meet again somewhere in Africa! Wow…must have guts..me..on the sea…Never!. Anyway Karin and Pete you must really enjoy! I am sure you will be missed here at T4a. All the best. Good luck. Great plans of a great courageous lady! I loved to follow you from Holland, and already signed up for the Moondust blog. Keep in touch. Good luck in the new adventures, will look forward to your blog. You will be missed on over landing “yes” but the wheel turns. It’s been a pleasure having you on board at T4A and I’ve enjoyed working with you on the guides. Also loved your trip reports and I will definitely follow Moondust on your travels. Good luck Karin and Pete! I’ve been following your Africa treks from London and will follow you across the Atlantic and beyond. Love your spirit of adventure – and readiness to follow your dreams. What a great adventure. We shall miss you Karin! Your blogs have always been informative and entertaining. You will be a tough act to follow. Good luck!